I didn’t want to paint this dresser. 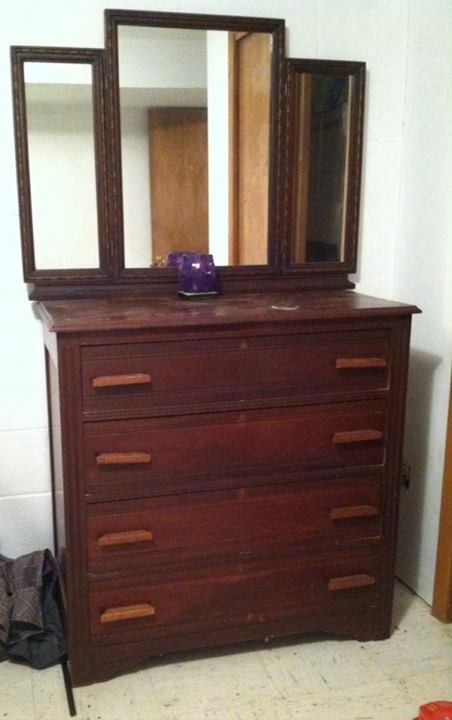 When I saw it on our local swap page, I had great visions of stripping and re-staining it to regain some of it’s former glory. When I saw it in person, however, it became painfully clear that wasn’t going to work. This little dresser was in rough shape. 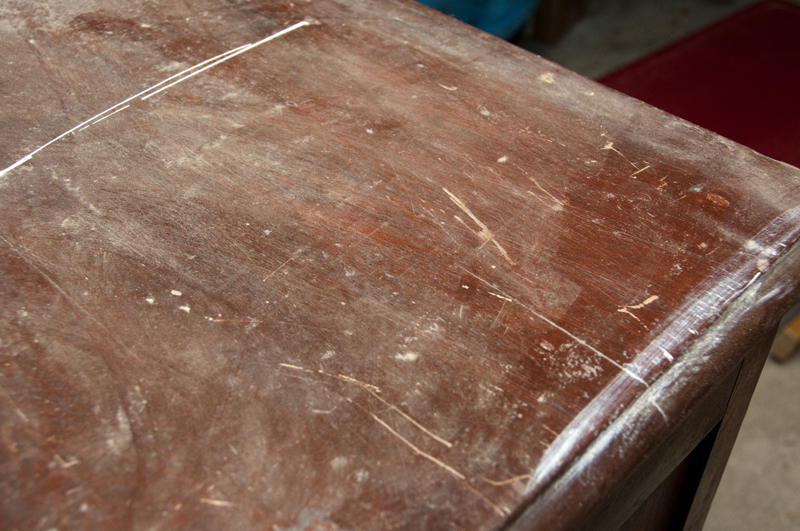 Someone in its previous life had attempted to repair some, rather serious, damage to the sides and drawer fronts by filling the gouges with reddish colored wood filler. Good intentions aside, it looked pretty sad. The top was scratched (deeply, in places) and there were so many dings in the drawers that I couldn’t fathom trying to fix them all. 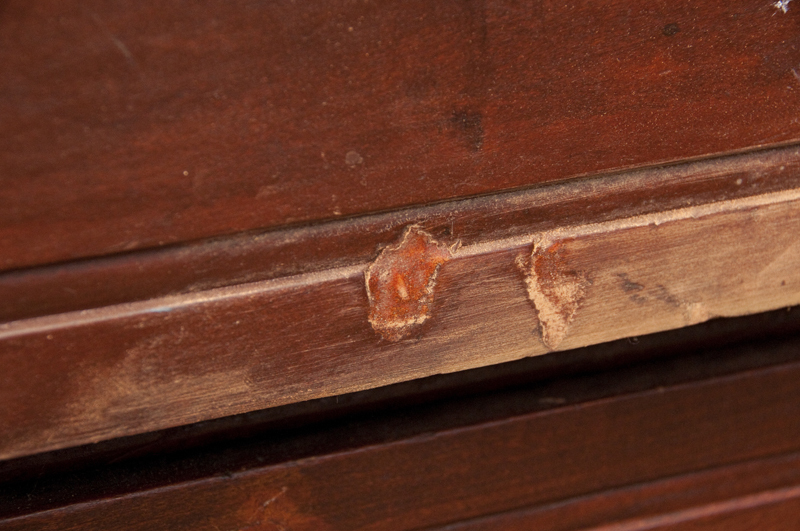 They had also decided to fill in the original keyholes on the drawers with the same putty. This kind of repair work is, unfortunately, beyond my talents. It would have to be painted. After filling the MANY dents and dings in the wood (seriously, what happened to this poor old thing? ), I removed the hideous handles, dug the putty out of the key holes, and removed the mirror (which was saved for future projects). I then sanded it down and prepped it for paint. I agonized for several weeks over what color to use. I wanted something neutral, something that played well with the classic lines of the piece, but I didn’t want it to be boring. 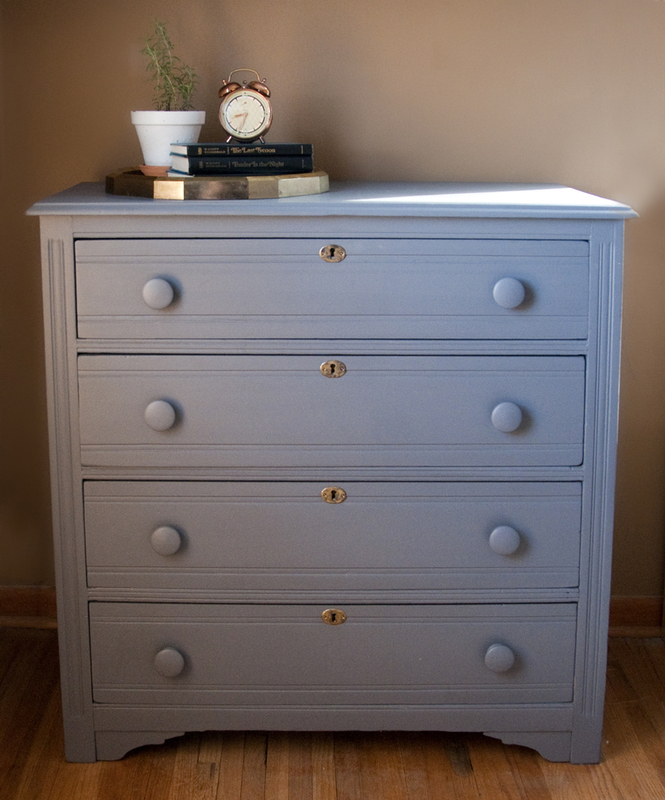 I finally settled on General Finish Milk Paint in Driftwood. 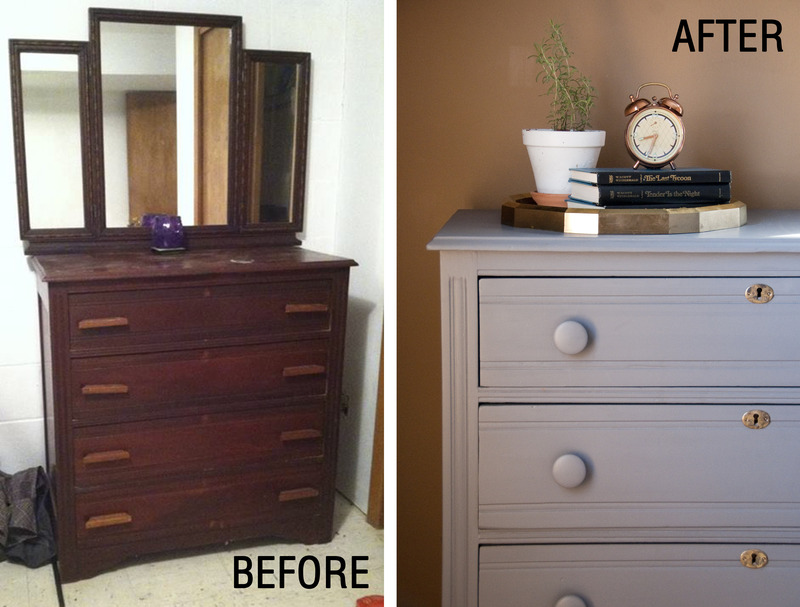 The color was a bit lighter and cooler than I was expecting, but I think it did a good job of enhancing the decorative elements of the dresser that had been hidden before. Being a fairly dark color, I didn’t bother priming first, which may had been a mistake. It took about four coats to cover everything. After the paint dried, I attached some aged bronze escutcheons for a little added interest. I don’t think this piece had escutcheons originally, but I thought it could use a little something extra. I then added some maple knobs we ordered from Lee Valley Hardware. Viola! A super easy, three day project. That looks lovely! I love General finish paint. Goes on so smoothly.